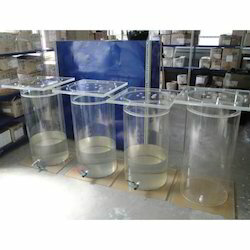 Our range of services include transparent chemical tank & flask. We are a noteworthy organization in the domain, engaged in providing Transparent Chemical Tank/Flask. These flask are broadly used in pharmaceutical, cosmetic, food processing, chemical distilleries and other allied industries for storing effluent water, diesel, chemicals and granules. Our offered flask are demanded in the market due to their high end features like impeccable quality, chemical resistant and long service life.